Quarter-plate daguerreotype in full, banded leather case. Mat stamped ANSON in bottom-left corner. 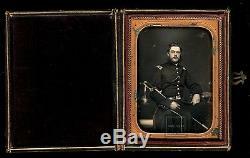 Officer with tinted red sash and painted gold buttons, buckle, and other highlights. I can clearly see the letters on his shoulder board, a lot of detail on his belt buckle (an eagle), and some vague shapes on his buttons. He is wearing eyeglasses and looks like he's holding his cap in his lap. 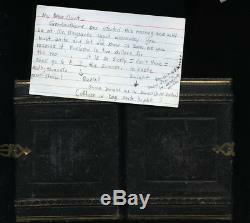 Included is an index card that ID's him as Dwight or D. Whoever wrote this card copied the writing from an original letter, which I have, but which is not included.. Again, the index card shown is included. Dag is unsealed with tarnish ring, but in overall very nice antique condition.. No scratches or abrasions, no corrosion. The white spots are mold spiders. Case is complete and in very good condition. 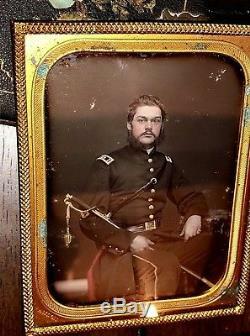 The item "1/4 Daguerreotype 1850s or Civil War Era Soldier Officer by Anson New York ID'd" is in sale since Wednesday, February 6, 2019. This item is in the category "Collectibles\Militaria\1784-1860\Original Period Items". The seller is "jack_mord" and is located in Woodinville, Washington. This item can be shipped to United States.